Hello Everyone, hope you are doing great!! 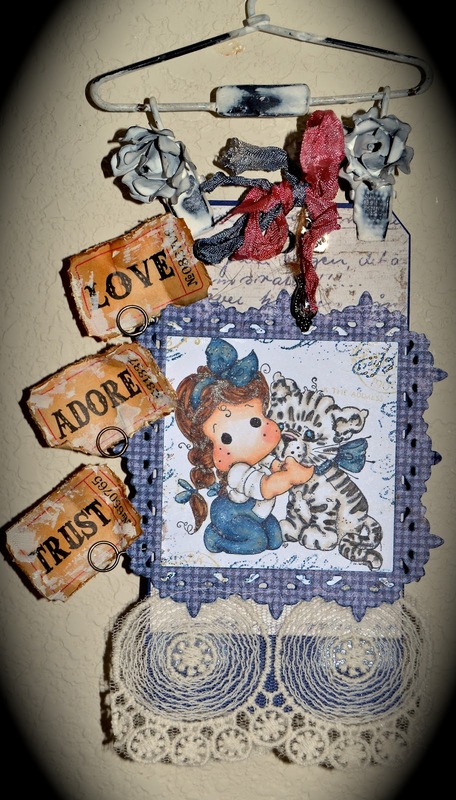 I am sharing a tag/bookmark with you as I had colored the image 3 months ago and I really wanted to use it. 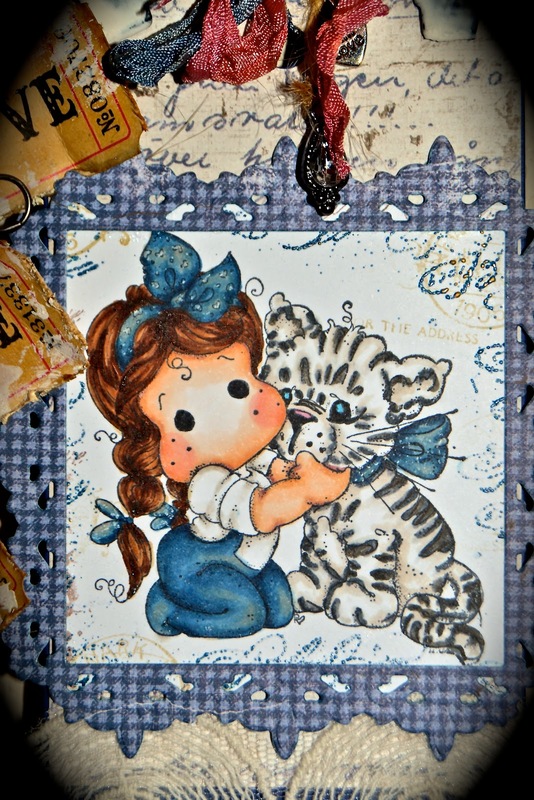 Tilda with Daisy Mae Tiger is colored in Copics and then I used some scraps from Maja papers to make the tag. There is frontage around the image. 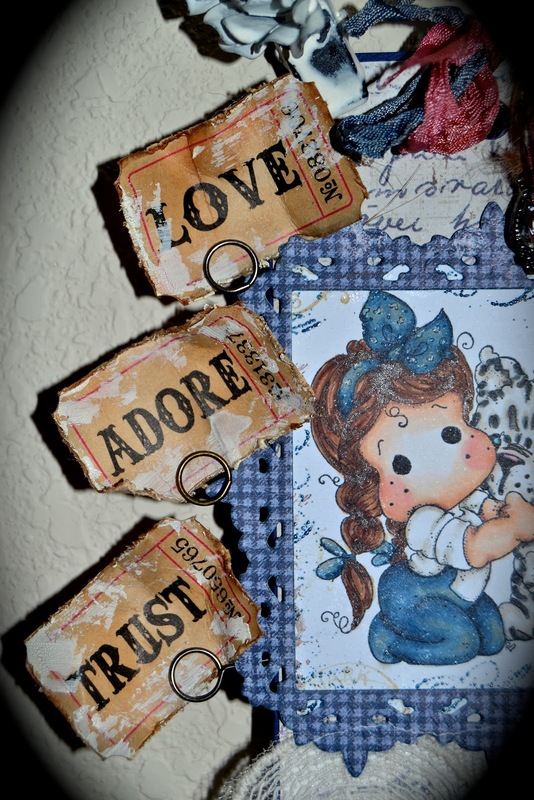 I used a wide lace for the bottom and Tim Holtz tags for the sentiments. Holding them are the pins from Ideaology. Lat weekend my husband was going to bring out the last trailer load of stuff and he decided not to. He just needed to relax and destress which we did and it was well worth it and deserved. This week I decided to try to decorate and get a few items we need like a dresser for the bedroom and hang some pictures. I am really wanting to paint my craft room furniture with the Anne Sloan paint I purchased but my Fibromyalgia is acting up so I need to be patient! lol Right patience is not my virtue!! Oh well I will show you some photos around my new house which is somewhat done, but it is a start. This is the matching table to the dresser I bought for our bedroom. It is repurposed barn wood and is rough and rustic. My living room was so small I had to buy all new furniture for it and this fits fine. 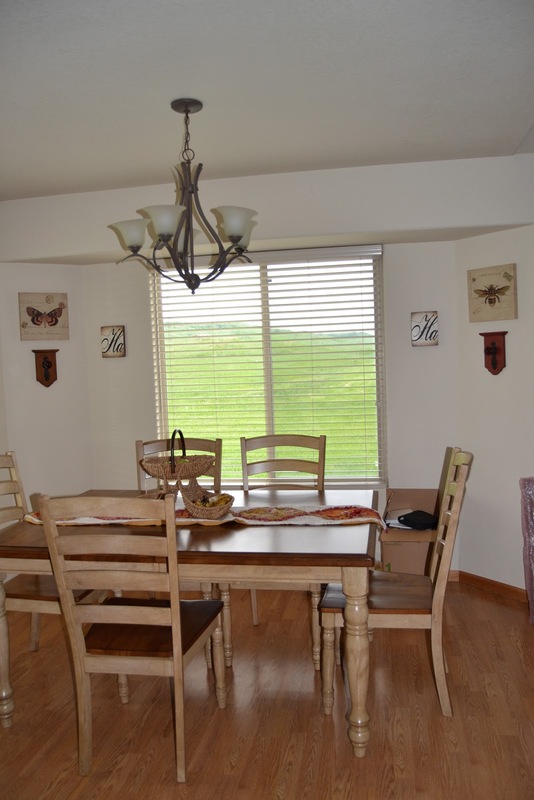 If the whole family would like to sit together or watch tv we would have to move to the basement family room for that. I love the big door in the living room for the light and the beautiful scenery. 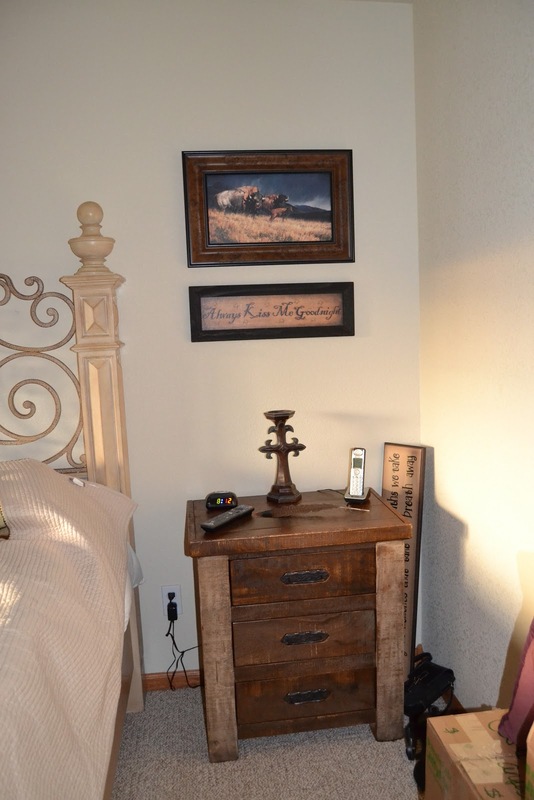 My TV stand is also reclaimed barn wood, very popular this year and I love it! Our dining are is a challenge, we had all 5 around it and the chairs were touching the walls. lol Also while I was trying to cook everyone was in the kitchen and I shooed them out, no room in this one! Due to lack of storage in the kitchen and in my opinion a wasted space that I utilized with the extra stand and drawers, unfortunately my garbage container is in sight also. That is rain on the camera lens but just wanted to show you the sunset after a storm that rolled by. The beauty of the hills and mountains is amazing. I have the best views from my home of the city and the mountain tops. Even driving around is beautiful. I am within 30 minutes from the top tourist sites and 7 minutes from the city. Perfect! I hope your weekend goes well as I am touring with my daughter and her boyfriend, they surprised me last night, 2am! Having a blast! Well, that Tilda was worth waiting for - she's charming! Love the shabby chic look of the whole tag. 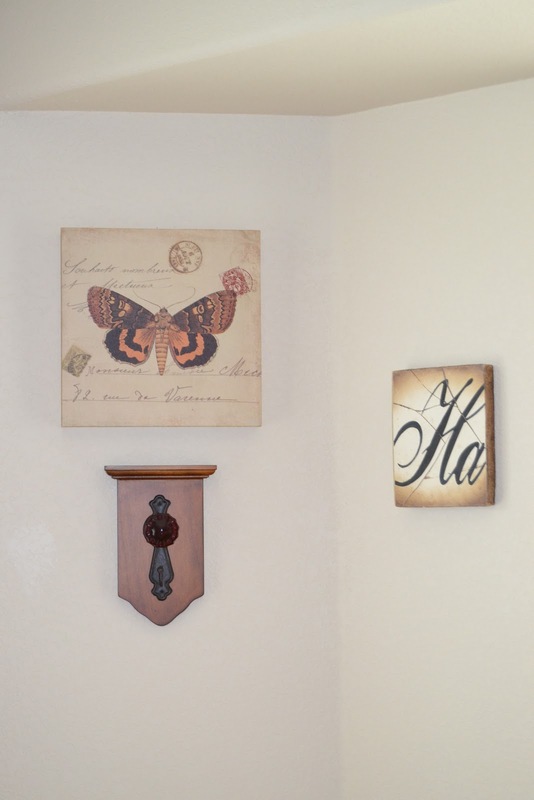 And the house is looking great... love those reclaimed barn wood pieces - how beautiful! And it sounds like a good decision to take a weekend off from all the moving stresses and strains. Hope you feel better and get to paint your craft room furniture soon! Gorgeous tag Kelly and it looks like you are getting settled in. Loved seeing the pics of your new home... best one is of the little pug (I love those dogs) nestled in among the pretty pillow. Looks to me like it is his now. Kelly this tag is awesome and I love the pics of your "Home Sweet Home". Your pug is adorable with that great pillow. You've got so much accomplished and have a nice relaxing weekend! Good Morning Kelly! You tag is soooo gorgeous....outstanding coloring! Love all the pictures of your new home.....beautiful! How does it feel going from a big 3 story house to a smaller house? Should be easier to clean. Can't wait to see what colors you have picked out. You always have a flare for color. Love your tag! Fabulous coloring. Thanks for the tour of your home it look gorgeous!!!!! Your Tag is so gorgeous dear Kelly, so beautiful styled and embellished, just gorgeous, as i said. Best wishes for you dear Kelly. Lots of Love and Hugs for you and your family.